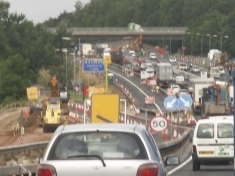 2008 was a busy year for the M27, because on the 19th January the cones came out for the start of an £18m scheme to add climbing lanes between J11 and J12. Then, on the 23rd February, cones were added to the stretch between J3 and J4 at Southampton to add an extra lane to either side. The climbing lanes were opened on the 1st September, but the hard shoulder there remains closed and the work at J3-4 is still ongoing. The schemes had been planned since the early millennium, and to be fair they were needed. Junctions 3 and 4 aren't very far apart, and between them lies Rownhams services. Junction 3 is for the M271, which is the main route in and out of Southampton and its docks, and junction 4 is where the M3 branches off taking a lot of traffic for London, Winchester and The Midlands. As a result, you get a lot of traffic 'junction hopping'. The other problem here is that this is the main road to Southampton, but it wasn't meant to be. The original plan was that traffic heading south on the M3 would be directed on to the M27 west towards junction 5, where a new motorway would take traffic in to the city, with the M271 being used only by traffic coming from the west. Obviously, that didn't happen, and this together with a general rise in traffic levels has led to regular congestion. J11-12 is no better, because here the road climbs steeply to mount the bottom of Portsdown Hill, and then descends towards Portsmouth in a section of road known locally as Apache Pass. The problem is that on a motorway there are lots of cars which don't mind staying in the inside lane with all the lorries, but as they approach the hill the lorries slow down to climb it, so the cars pull out in to the middle lane. However, these cars don't like travelling fast (that's why they stay with the lorries), so everyone who is usually in the middle lane pulls out in to the outside lane, and everyone who is usually in the outside lane has to... oh dear. That's how the queues build up, and although there is a good excuse for J3-4 being busy there isn't one here, as the motorway is only 30 years old and the hill has always been there. The M3 came along 10 years later and, on a much gentler slope it got a climbing lane. Strange. Here are a large selection of photos taken during the roadworks, focusing largely on the climbing lanes because they're closer to me. The cones have come out, but there hasn't been any work. The central reservation has been removed, although not a lot else has happened. The situation from the road. Back on the road, and the central reservation is complete and work is ready to start on the verge. On the road in the other direction, and work has started on the verge. Work is well under way at J11. Still on the road, and it looks like all the cutting is complete. On the road in the rain, and this time work has started on the verge-side barrier. The new lanes have been put in and most of the new signs are up. The situation four days before the new lanes opened. Driving along the eastbound carriageway for the first time since the new lanes opened. See how the climbing lanes are doing right now, with the Highways Agency traffic camera. The camera is looking east towards J12. The situation drivers are faced with as they approach the roadworks and J11. The central reservation and the gantries have been removed. The new central reservation is up and the work has started on the verge. It may be a Sunday, but traffic is still heavy. Some of the new gantries are now in place, although it doesn't look like the new lane is ready yet. The new lane was opened in time for Christmas, although there are still some smaller things to be done. A 50mph SPECS-enforced speed limit still applies. See how the road is flowing right now, with the Highways Agency traffic camera. The camera is located at Rownhams services looking east. Highways Agency - official website for the widening works and climbing lanes. CBRD - Futures - M27 Widening. © 2019 Motorway Services Online, unless stated otherwise. Information provided and media shared subject to conditions.